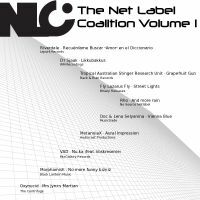 NetLabel Coalition Volume 1 is another compilation album that indie music enthusiasts should check out. The NetLabel Coalition (NLC) is composed of netlabels that are promoting and celebrating free music with enthusiasts around the world. They hang out in forums hosted by The Creative UnCommons. This album has some really good tracks for lovers of gutsy electronic music, as well as for those who enjoy quiet ambient sounds for introspection and relaxation. I personally like two tracks in this free album: Vienna Blue by Doc & Lena Selyanina, which sounds perfect for beginning credits, end credits, or even melancholic sequences of a film (drama); and Mrs. Jynx’s Martian by Oxynucid, which sounds like something that would play in a “chill-out party” with ethereal angels. Street Lights by Fly Lazarus Fly could’ve sounded much better if the vocals were not overpowered by the strings. There are good tracks, there are almost-there tracks, there are tracks that you may not like so much, but it is very likely that you would find something that you could relate to, or even remix. It is great news that the collaborating netlabels have agreed to work together to promote their own catalogs and artists. This way, we can expect a follow up to this very good compilation and enjoy free good music.